Who doesn't want to "Buy Low and Sell High?" You may be sitting on that exact opportunity right now without even realizing it. You've probably heard the advice that it is important to rebalance your portfolio. But, then something more fun or seemingly more important comes up, and that falls to the wayside. Busy family lives, kid's sports schedules, or even just going to the gym can take up your precious time. The recent rally in the U.S. stock market to all-time highs could have left you holding more equity exposure – and along with that – more risk than you wanted or even realized. It is important to analyze your total financial picture and current asset allocations at least once a year to make sure recent market fluctuations haven't stretched your stock, bond and tangible asset allocations in the wrong direction. Here's how it works. Let's say you have a hypothetical portfolio allocation of 60 percent stocks and 20 percent bonds and 20 percent tangible assets. The stock market has rallied to all-time highs recently. 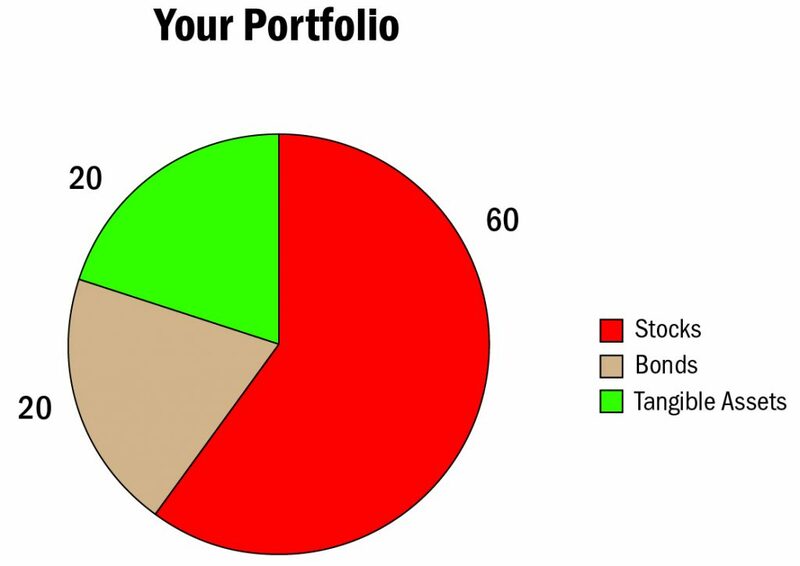 This is what your portfolio may actually look like now. You could be sitting on an 80 percent stock, 10 percent bond allocation and 10 percent tangible asset allocation without even realizing it. Many investors right now may have larger allocations and greater exposure to stocks than they want or even realize that they have. If a bear market cycle in stocks emerges, that could wreak havoc on your long-term financial goals. Rebalancing will bring your portfolio back into alignment with your goals and risk tolerance level. Rebalancing is a tool that investors can use to maintain their long-term desired investment allocations. Rebalancing can help with risk control. Rebalancing your portfolio may ultimately deliver higher returns than a portfolio that is not rebalanced. Getting started: Rebalancing your portfolio is as simple as selling a portion of your stock allocation and buying more tangible assets to bring you back to your original goals. Gold is at lower price levels that we saw in 2016 – which offers long-term investors a better value and buying opportunity. 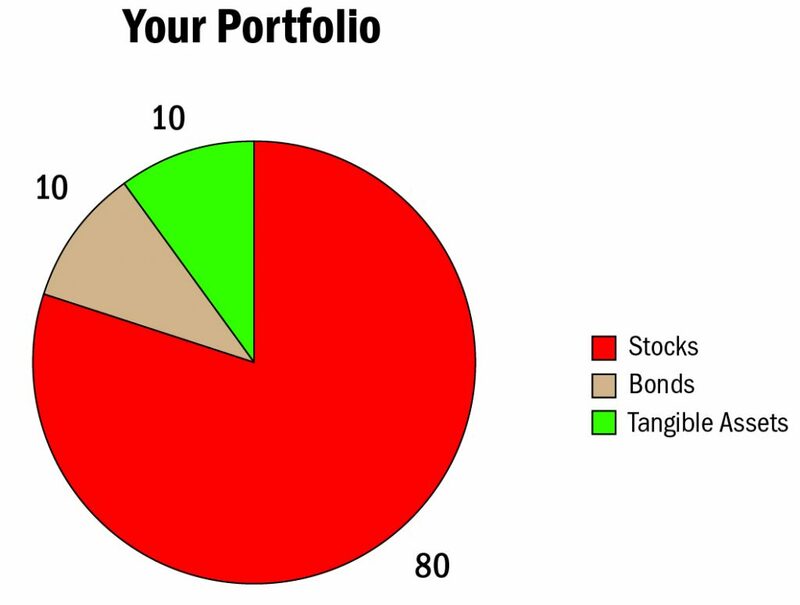 It is worth taking some time to develop a portfolio that you are comfortable with and will allow you to sleep at night. A properly diversified portfolio includes non-correlated assets that can help smooth market volatility and boost overall returns. Gold and other precious metals have a low correlation to stocks. When stocks turn negative and plunge sharply, gold tends to rise in price significantly. A properly diversified portfolio that includes gold can help protect your wealth. It’s also smart to rebalance if you have inherited money or if you experience a significant change that affects your financial holdings. Blanchard has advised individual investors for over 40 years on portfolio diversification through tangible assets purchases. Our portfolio manager can work with you to discuss your long-term financial goals and overall risk tolerance levels. We can offer a personalized investment plan tailored specifically to help you meet your goals. Contact Blanchard at 1-800-880-4653.